A database schema of a database system is its structure described in a formal language supported by the database management system (DBMS) and refers to the organization of data to create a blueprint of how a database will be constructed (divided into database tables). The formal definition of database schema is a set of formulas (sentences) called integrity constraints imposed on a database. These integrity constraints ensure compatibility between parts of the schema. 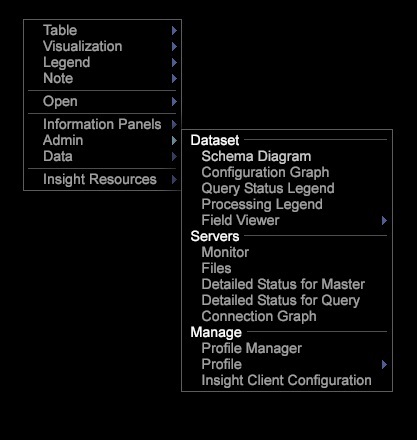 If you are starting new in Adobe Insight, then the first thing is to understand Schema. How to Add Annotations in Adobe Insight? 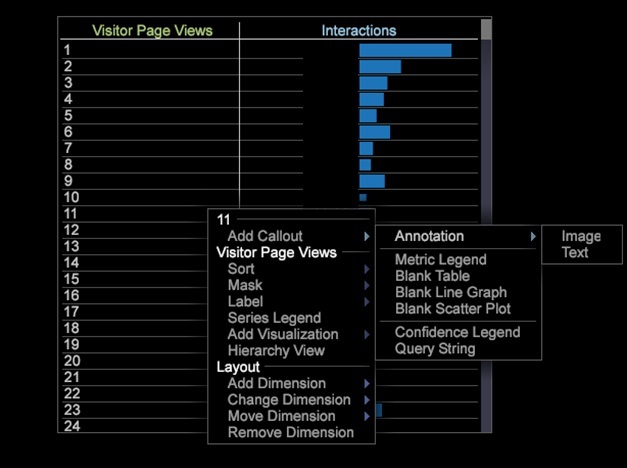 In Adobe Insight, you can add easily annotations in any chart or table. Through Annotation feature, you can add any text or image which can help you in noting down any particular trend, event, observation or any other noteworthy item. Right click on your Workspace.Select “Add Callout” -> Annotation -> Image/Text as shown in below pic. This is another awesome tool “Twitter Venn” from Jeff Clerk. You can enter the brand and competitor names separated by commas and search. 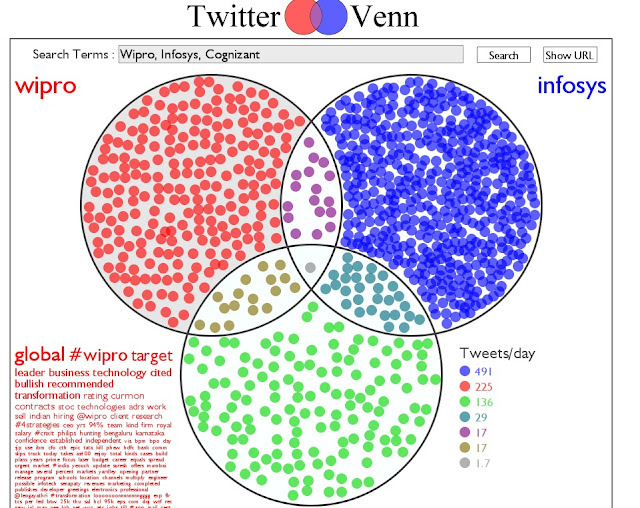 After the data is retrieved a Venn diagram is shown which illustrates the rate of tweets containing the search terms in the various combinations. As per Jeff Clerk, this tool supports investigation into the relationship between how words are used within the messages of all the people usingTwitter. 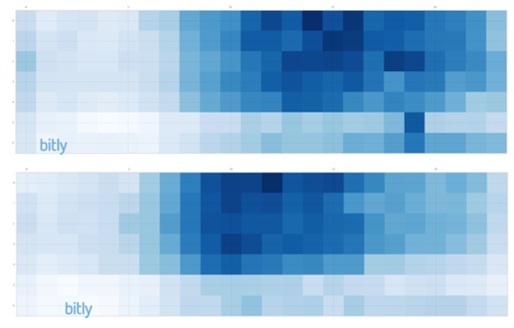 It also helps in visualize the overlap between various sets of topics. When you click on the bubbles, it will show your related keywords cloud on bottom left hand side. Whereas on bottom right hand side you can see the average tweets per day. 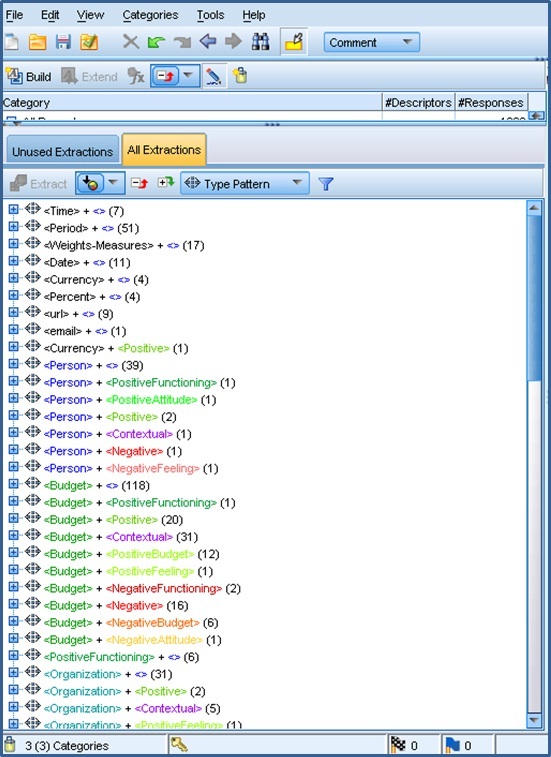 Recently I came across Twitter Spectrum tool from Jeff Clerk. This tool is modified version of News Spectrum tool. Here you can enter two topics and then analyse the associated words based on twitter data. Blue and Red color represents the associated words of those two topics whereas Purple represents the common words. You can click on any word to see the related tweets. The visualization is really awesome and you can easily analyze the data. 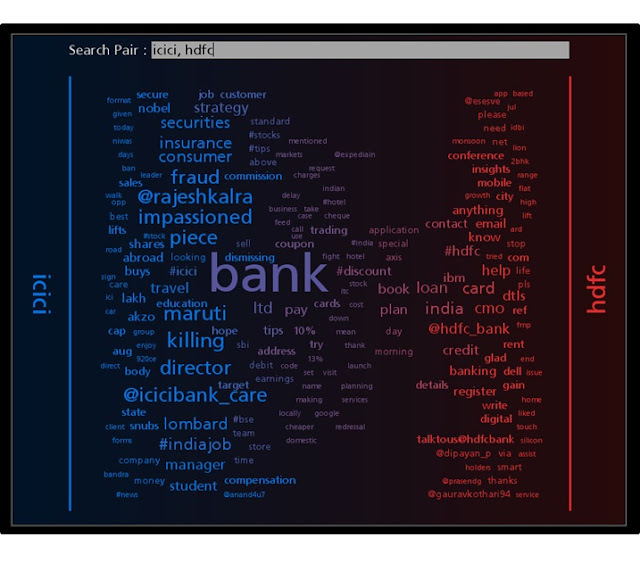 If you analyze the associated words, you will find that “Security”, “Insurance” words are associated more with ICICI bank whereas “digital”is associated with HDFC bank. But words like “online banking”, “mobile banking” are still missing. This type of visualization will help the brand to plan their startegy of type of tweets to be posted on twitter. In our earlier posts, I wrote on how to add any particular key entity into the category. 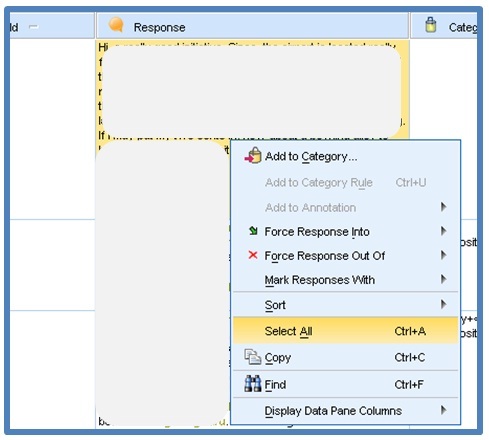 The other method is that you can add directly from the response pane. When you have done almost all the categorizations and left with few. Browse through those uncategorised responses and read them. After reading if you find that any key entity concept should come in particular category then select that entity and right click -> Add to category. Please share your best practices/tips on Text Analysis!!! 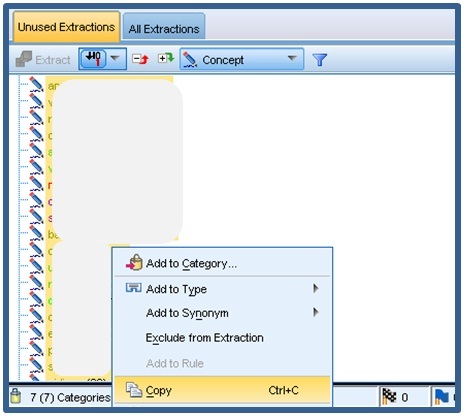 Here is one more post in this series of best practices / tips on SPSS Text Analytics. 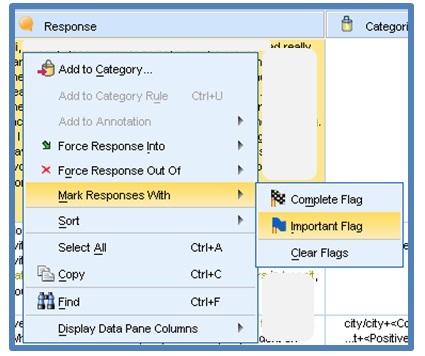 If you want to mark any response with flag for future response, then right click on that response -> Important Flag. Please share your best practices/tips of Text Analysis!!! When we are using Google Analytics to track clickstream data, we should segment the internal traffic and ouside traffic for our analysis. We all mainly use IP addresses to exclude the internal traffic. But it sometimes become difficult when we have the offices in different geo’s. Filter out all the internal networks by your company name. You can see all your internal networks there. You can either create an advanced segment or create a new profile excluding the internal network traffic. It will copy all the responses with categories defined for each response. Here is one more post in this series of best practices / tips on SPSS Text Analytics for surveys. If you find any particular survey text which is not coming under relevent category, you can force that response into required category. Please share your best practices / tips of Text Analysis via comments!!! What will be the Best Time to Tweet? Recently Bit.ly posted an article on how the day and time ofthe post/tweet affects the eventual amount of attention it will receive. As per the bit.ly study, posting between 1 – 3 pm EST Monday through Thursday is best for achieving a high click count. But tweeting after 8:00 pm and as well as posting links after 3:00 pm on Fridays should be avoided. But is it really any fix time to get the most traction on Twitter? You have to tweet based on your market segment. Who are your customers? In which time zone are you customer in? One should tweet based on time zone in which customers are there. Also it depends on what is the persona of those customers are? For example, one should tweet based on their target customers personas which can be housewives, teenagers, business executives, retired people etc. Analyze the habits of your target customers. Then map it with their time zones. That will give you the best time to tweet. 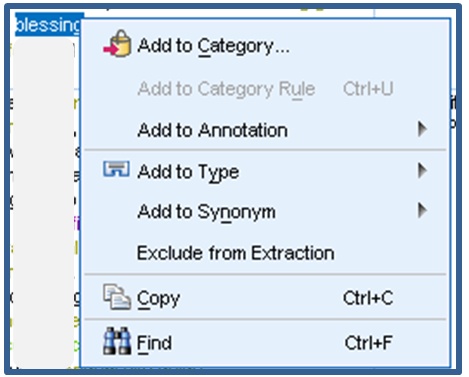 Here is one more post on "How to rename the categories" in the series of best practices/tips on SPSS Text Analytics. After creating the categories, if you want to rename any category then right click on that and click on “Rename Category”. Write a new name for the Category. In my previous posts, I have written on How to start using SPSS Text Analytics tool and How to do categorization. Here I am sharing some more best practices/tips on SPSS Text Analytics tool. Define a file name and location to which the category data will be exported. 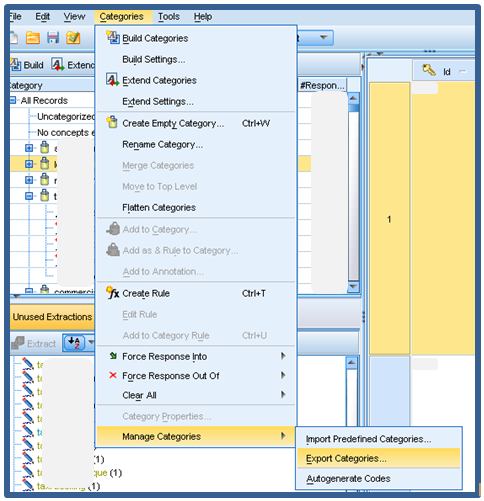 Choose the format for the category data that will be exported. You can choose between Flat/Compact list format or Indented format. Here I am sharing some more best practices / tips on SPSS Text Analytics tool. 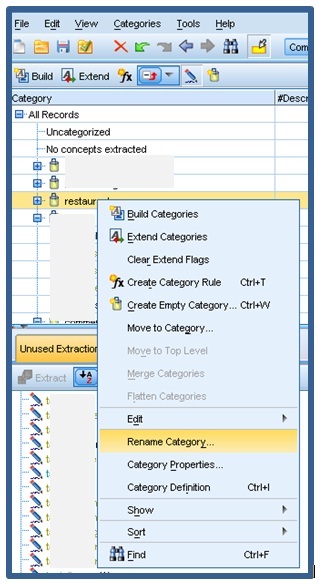 If you wanted to copy the entire list of key concepts from the tool, then select all the entities. Then right click on it and click copy as shown in below pic. This list you can paste in excel for your reference and analysis. As we know the tool extract the key concepts in starting of the analsys. But some of those might not be relevent to us. But we can easily exclude these extractions from our list. 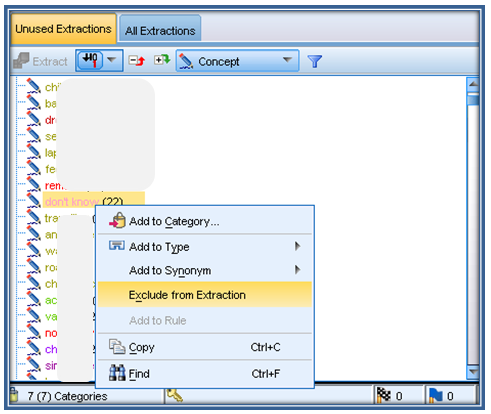 To do that just right click on that particular entitiy and click on “Exclude from Extraction” as shown in below pic. Please feel free to share best practices or tips on Text Analytics!!! 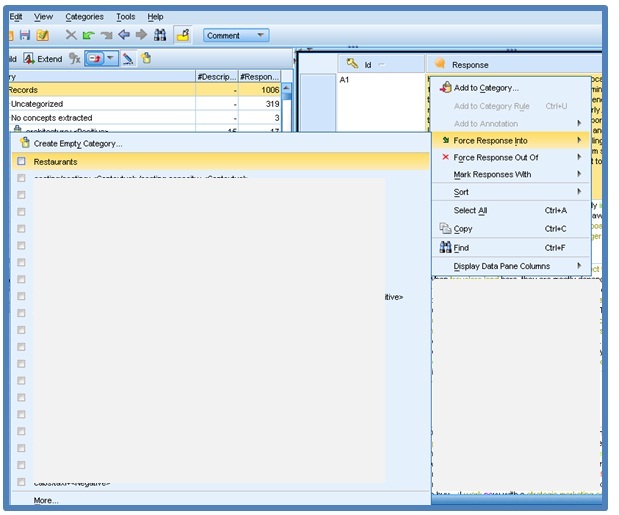 Here I am sharing some more tips on SPSS Text Analytics tool. Through this you can quickly analyse which one has the highest frequency in your survey and focus on that first. In my previous posts, I have written on Beginner level tutorial of SPSS Text Analytics tool and how to do categorization. Here I am sharing some tips on categorizations which will give useful and meaningful insights to your data. You might wanted to know that how many said positive or negative about the food category. To create category for this go to Advanced catgorization. 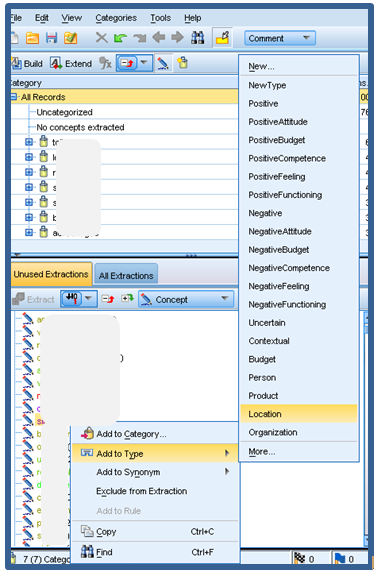 Select “food” dimension, AND symbol “&” and then select “positive” sentiment. Rememeber to “Test Rule” before saving it. This category will tell you how many said positive about the food in the survey. Same way you can create the “food & negative” category.